Every time my endlessly sharp 90-something, Polish-Catholic Grandma Florence walks by one specific framed series of three photographs on her wall, she curses the memory. She grumbles and shakes her head at the disappointment–she should have been in this particular set of pictures. The photos in question were taken in 1996 at University Synagogue in Irvine–a sprawling suburban Southern California town not predominantly known for its Jewish population. In them I stand at the bimah with an awkward smile, braces on my teeth and crushed purple velvet draped below my knee. Close family members who appear to be beaming surround me in each shot, toothy smiles abounding. And why shouldn’t they? Their daughter, sister, niece, has just completed the most sacred moment of her life thus far. At the age of 14 (I was a bit of a late bloomer), after years of struggle, Hebrew lessons and stressed-out tears, I had become a bat mitzvah. But I’m getting ahead of myself. The path to that early December mid-1990s day was not an easy one, nor was it one planned out for me before birth. 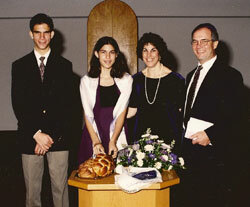 Having liberal, make-your-own-decisions interfaith parents made my path to Judaism a shaky one. With my father a Polish-Irish Catholic and my mother a Russian-Hungarian Jew, we celebrate a multitude of holidays and attended sporadic services at both temple and church. Growing up, we spent Passover poolside at Nana Eva and Papa David’s cream-colored Vista home, and Easter plucking colorfully painted eggs from the familiar and warm Antioch yard of my Grandma Florence and Grandpa Mat. When, at the age of 10-and-a-half, I began to lean more toward my Jewish roots and said I was interested in learning more, both my parents happily obliged. The Catholic father was just happy his daughter sought out knowledge, no matter what form. Together they signed the family up for membership with a local Reconstructionist synagogue and got me a young Israeli tutor who taught me by translating my favorite Green Day lyrics into Hebrew. For their part, the Catholic side of the family, scattered across Northern and Central California from Concord down to Fresno, couldn’t be more supportive. We still went to midnight mass on Christmas and ate hearty amounts of stuffing at the expansive Antioch table. As the big day approached, my Catholic grandma and grandpa, aunts and uncles readied themselves with hotel reservations and new synagogue clothes. They were all set to attend, excited for their family’s first bat mitzvah. No one back in Ireland or Poland had ever had such a ceremony, and it was of particular importance to my Grandma Florence. My nana and papa on the other hand, had attended hundreds of b’nai mitzvot ceremonies over eight decades, reveling in the magnitude of a Jewish child’s ascent to adulthood. When it came time for me, the youngest of their grandchildren, my papa was already quite sick and we feared he wouldn’t be able to make it to the ceremony. But at the last minute, his health would take a momentary turn and he was able to celebrate, cane in hand. With decorations laid out, each purple-satin covered round table was affixed with a movie star-style clapboard frame pronouncing the table’s theme. The Catholic family members were set to sit together near the front of the room alongside the Jewish grandparents. Emily’s Grandma Florence is still around, still with it and still annoyed that she didn’t get to be at the bat mitzvah. The health worries about papa had been so tense and troublesome that when we finally received word that he was well enough to attend, we all let down our guards and let ourselves get excited for a big multi-family gathering. But the day would get off to a shaky start. There came a shock from the Catholic side of the family, the side we hadn’t been worried about. It was my Polish grandmother Florence’s turn to call with bad news, the worst of news–in hushed and hurried tones, I overheard my parents discussing the recent change of plans. My sweet Irish grandfather Mat had fallen ill unexpectedly. He learned he had a serious bout of pneumonia and could not travel. Crushed, my grandmother realized she too would have to stay behind and let the aunts and uncles represent the Catholic side. So Grandma Florence stayed back in Antioch and nursed Grandpa Mat back to relative health. Not more than three months after the bat mitzvah, my Papa David would take another turn for the worse and die in his sleep. A decade later, my Catholic grandpa and Jewish nana would also pass. Now Grandma Florence is the only grandparent I have left. This is not the story of my Catholic grandmother’s first bat mitzvah. This is the story of her yearning to attend her interfaith granddaughter’s defining moment. This is the story of Grandma Florence’s strength and her commitment to family–no matter how heartbreaking the decision may have been. A strong and noble woman, she realized that sometimes you have to sacrifice your own wishes for those who need you most. Grandma Florence couldn’t make it to my bat mitzvah, but when I see her glance toward the pictures on the wall and hear her grouse about the visit that wasn’t, I know how much she wanted to. Emily Savage Emily Savage is a staff writer and photo editor for j. the jewish news weekly of Northern California. In addition to her Jewish music blog on the j. 's website, www.jweekly.com, she also pens music pieces for the SF Weekly. In the past she's written for Anthem magazine, Metro.Pop and Gazette newspapers. She's had the great fortune of interviewing everyone from twangy country legend Wanda Jackson to Israeli rockers Monotonix.